Investing in precious metals is one of the most secure ways to protect your investments. Having precious metals is the best way to diversify your portfolio. Stocks can plummet to zero while the American Dollar becomes worth less. Gold and Silver never goes to zero. When in an unstable economy, gold and silver is a great way to invest. East Texas Coin and Bullion will sit down with you and help explain the process on investing and will help you with every step. 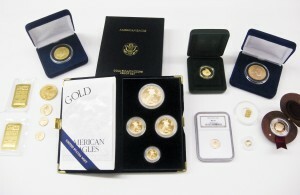 Investing in Gold can start under $100 and you can start investing in silver for under $50.